I teamed up with Comet TV for an awesome January Giveaway! If you are a fan of The Craft you'll want to read on about this giveaway! 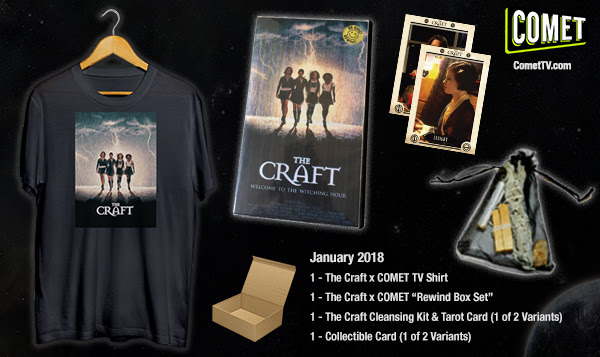 Comet TV is celebrating January with this witchy prize pack that represents Andrew Fleming's supernatural horror film The Craft (1996). Comet TV crafted an exclusive swag pack that any lovers of The Craft will adore. The prize includes a T-shirt, clamshell box and more. There are other awesome new movies showing Comet TV as well aside from The Craft. Check out their schedule HERE. 1 – The Craft Exclusive COMET TV Clamshell Box: This The Craft exclusive clamshell box features exclusive throwback artwork and will immediately take you back to the days of waiting in line for new release movies at the video store! This giveaway is open to US residents only; one entrant per mailing address. Deadline to enter is midnight on the February 3rd, 2018. The winner will be notified by email on the February 3rd, 2018 and must respond within 48 hours to claim their prize. The prize will be sent via either FedEx or USPS. The winner will be subject to eligibility verification. RealQueenofHorror.com and Comet TV has the right to remove entries if any of the above terms and conditions have not been followed.